FROM HER BIRTH, SURROUNDED BY the band of robbers to which her parents, robber chief Mattis (voice of Rufus Hound) and his wife Lovis (voice of Morwenna Banks) belong, Ronja (voice of Teresa Gallagher) grows up feeling loved and blessed and is truly happy. On the night of her birth in the middle of an electrical storm, the huge castle in which the robbers live is split in two by lightning. The chasm that has opened up between the two parts is known as Hell's Gap, and the robbers live in one side of the castle, which is surrounded by a large forest. The bandits have a rival for the contraband stolen from travellers through the forest; the ruthless robber chief Borka (Bob Golding). Blissfully unaware that her family are on the wrong side of the law and knowing no life other than the confines of the castle, Ronja reaches the tender age of ten, when her father thinks it is time for her to discover the forest for herself. She is excited to have her first taste of freedom, but her father warns her to be careful not to fall into Hell's Gap, to swim if she falls into water, to stay away from Borka's robbers and the grey elves  strange little creatures with bright red eyes  and to beware of the dangerous Harpies. He cautions her that she must be back before dark. Little does she realise that her happiness will be threatened and her loyalties divided when she meets young Birk (voice of Kelly Adams), the son of her father's enemy, in an unexpected place; and that the antagonism they first have towards each other will be replaced by an enduring friendship. This utterly charming and well-observed tale translates exceptionally well from page to screen. 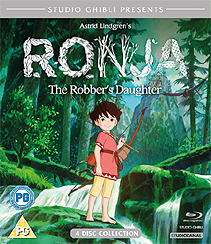 Based on the beloved novel of the same name by acclaimed Swedish writer Astrid Lindgren (Pippi Longstocking), Ronja: The Robber's Daughter in the hands of the legendary Studio Ghibli (Spirited Away) has become a fantastic, well-observed and visually pleasing 26-part story of adventure and friendship. Myth, magic and imagination! Ronja: The Robber's Daughter also features the voices of: Jules de Jongh as The Harpy; Adrian Edmondson as Noodle Pete; Ish Fredman as Musician A; Rasmus Hardiker as Fjosok; Paul Mari as Passenger; Jeff "Swampy" Marsh as Musician B; and Giles New as Lill-Klippen. Music is by Satoshi Takebe; The Call of Spring Music by Hiroko Taniyama; Original Japanese Lyrics by Goro Miyazaki (English Lyrics: Gavin Alexander and David Freedman); Arranged by Andreas Lindgren, Mathias Lindgren and Jonathan Vincent; Vocals by Lola Moxom; The Wolf Song Music by Satoshi Takebe, Original Japanese Lyrics by Goro Miyazaki, based on The Wolf Song by Astrid Lindberg (English lyrics by Gavin Alexander and David Freedman); Vocals by Jess Robinson; Translated from the original Japanese by Taro Goto; Executive Producers are: Nobuto Ariyoshi, Atsuko Kashiwagi, Keisuke Tsuchihashi and Toyoki Ota; Produced by David Freedman and Geoffrey Wexler; Producer is Nobuo Kawakami; and Directed by Miya Zaki. In Association with Studio Ghibli and Saltkåkan, The Astrid Lindberg Company. * STUDIOCANAL announces the release of the highly anticipated first-ever television series from Studio Ghibli of Ronja: The Robber's Daughter, available in the UK on DVD and Blu-ray on 4 December 2017. Certificate: PG | Running Time: 10 hours 51 minutes | Episodes: 26 Episodes on 4 Discs | Extras: Interview with Goro Miyazaki | Press Conference | Making of Parts 1-5.